We are counting down the days; less than two weeks until we head back. Bittersweet is all I can say about this time of year. 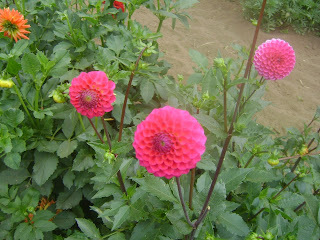 My dahlias are just starting to bloom and it looks like we are going to miss out on the artichokes again this season. At least our caretaker and his wife will enjoy the fruits of our labor. Once again I am torn between the two places that we call home. A week ago we hiked Sweet Creek Falls Trail (picture of bridge above). This was a new adventure for us, amazing how much water was still there after months of no rain. While walking I thought back on how the bridge symbolized the connection between our two different lives. This salad was inspired by ”Jerusalem”, the cookbook. I am such a fan of all of Yotom’s recipes. I checked my site and I have eleven other recipes from him. His cooking sense and style is my favorite. One of the great things I love about cookbooks is that you can pull out the same book months or years later and find a new recipe; one that you did not pay so much attention to previously. Maybe it was a different season or you are in a different place mentally, who knows….. This recipe has been inspired by "Jerusalem", A Cookbook by Yotam Ottolenghi and Sami Tamimi. Combine vinegar, onion and dates in a small bowl. Add a pinch of salt, sumac and mix well. Let marinate for 20 minutes. When ready to serve toss spinach, date mixture, almonds and olive oil. Serve immediately. Beautiful dahlias, Cheri. Your salad looks so fresh and yum. Thanks Anu, we really enjoyed this one. this is one of my favorite ever salads! Thanks Joanne, this is definitely one of my favorites. Dates in a salad sound yummy. A nice touch of sweetness. Thanks Dannii, it is a nice touch of sweetness. I love the way you talk about and share your homes with us. Portland and Arizona are places I traveled to a lifetime ago. I have a sense of them and each place is filled with lovely memories for me. You bring those memories alive and make me feel a part of the places through your writing. I, too, am a big fan of Ottolenghi. I love all of his books and revisit them often. Like you, I am always finding new recipes each time I open his books. Your salad looks divine. Thank you so much. Thanks Dena, what a thoughtful comment, I feel much the same way about your posts.......Take care! What a yummy salad, Cheri. I will have to make it tonight! Thanks Coco, hope you like it. I totally agree with you about picking up an old cookbook and seeing so many possibilities! For some reason, I always think Ottolenghi's recipes are intimidating. I need to open my mind! Love the creativity of it all. Hi Monica, some of them are, that's why with this particular recipe I prepared everything quite different from the original. Thanks! Your dahlias do look as if loving hands planted them <3 How apt that you've got a delightful salad with dates and honey (almonds) from a cookbook named Jerusalem just as the Jewish New Year is dawning. Hi Kim. you are the only one that mentioned this. Thanks!! This sounds like a great salad, full of flavour. I love the use of sumac in this salad - it's not used nearly enough in cooking. It looks delicious! Hi Amy, I agree sumac is delicious! I was wondering when you were heading back..oh we walked a walk such as this in Maine in june..different..but you know what I mean..an escarpment over the sea. I have never made anything w/ sumac..thanks for the idea! Hi Monique, wherte we are in Oregon has been compared to Maine, I would love to travel there. This salad looks delicious! I have never tried dates in a salad before! Thanks Cathleen, dates bring a wonderful sweetness to this salad. Hi Charlie, so do I....thanks! I love this salad and I have all the ingredients in the fridge or pantry. I'm heading to the kitchen right now. Yummo! Thanks Maureen, hope you enjoy this! I love spinach salads and I LOVE that you used sumac, one of my fave spices. Great job C! Spinach salad is so tasty Cheri. Dates would be an awesome addition, plus sumac. Love the pictures. That bridge is lovely...Thank you for your sweet visit and kind words Cheri. Hi Pamela, I cannot grow spinach for some reason and it's one of my favorites. I love this salad. I made it way back when and posted about it too! Maybe it is because it is so good! Now I want it tonight Cheri, but I am out of sumac! Hi Abbe, I bought my sumac at Trader Joes of all places, take care! Spinach salads are my favorite! Love the sumac in here! Good luck with with your trip back home! Thanks Kelly, we are taking a side trip so it should be fun. I love this salad recipe - and that cookbook too :) You were so right when you said 'great minds' when I posted my spinach salad the other day - now I want to run to the store and get ingredients to make this one! Thanks Phi, spinach salads are my favorite. This is one of my all time favorite salads - so creative and all the flavors really stand out and blend at the same time. I did the fried pita pieces too - coated in sumac :) Yummy! Have a great weekend. Hi Tricia. I did not do the pita, bet that was delicious. Thanks, hope you are having a great week-end. Hi Tandy, I cannot decide which one of his books I like best, they are all great. Thanks for the heads up on the captcha. I am with you about loving Ottolenghi's work - he cooks and thinks the way I want to! This salad - which I missed - sounds perfect with such interesting combinations of sweet, savory, and tart. Thanks for bringing it forward! And so sorry you will miss the artichokes! Hi David, oh well they will probably grow faster in Phoenix. Thanks, leaving this week. Looks like a yummy salad! Great combination of sweet and savory ingredients. It must be difficult to leave Oregon. Your dahlias are so pretty. Believe it or not, it is actually raining here today and the lows were in the 70's. A good sign of cooler weather to come! Hi Shari, I heard that you AZ had quite a monsoon season, how lucky you are! !